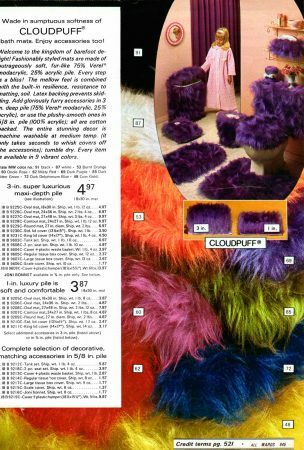 When Muppets attack small children, the probably do it from the bathroom, where they first disguise themselves as 3″ shag carpets in dayglo colors like these. I feel so sorry for that young girl, as she is just moments away from being devoured by what she alwasy thought was just a groovy trash can. Available in colors only seen on Doctor Teeth and the Electric Mayhem. I've come to a realization that the 1970s design happened because product designers who lived through the 1960s tried to figure out how to bring it to ordinary families. The result was an acid trip recycled for suburia: excess without the drugs to justify it. How else do you explain these “Cloudpuff” bath decorations? 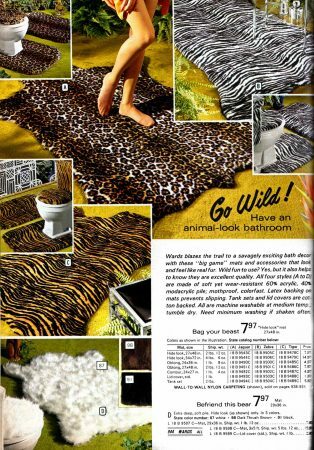 Or the “animal-look” bathroom? Have you ever stepped into one of these, anywhere, anytime? 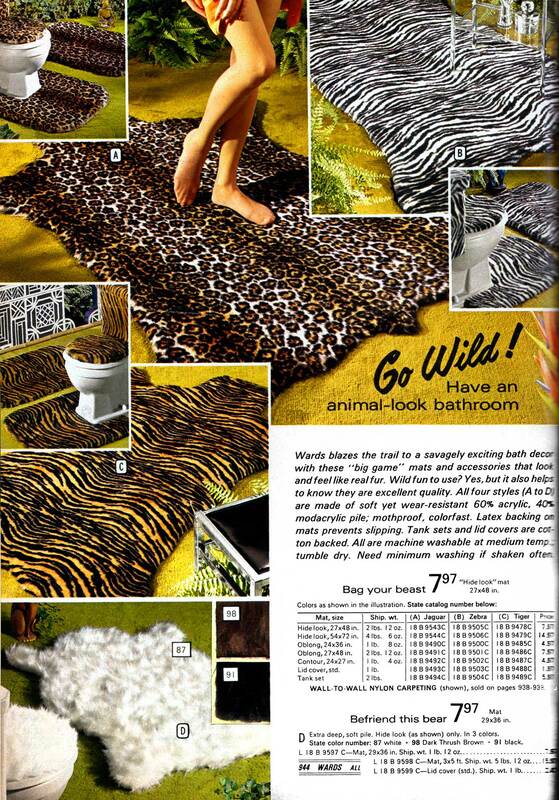 Available in cheeta, tiger, zebra, or…polar bear, apparently. At least the copywriter got to “go wild” with animal-themed descriptive copy. Zoom in to read. 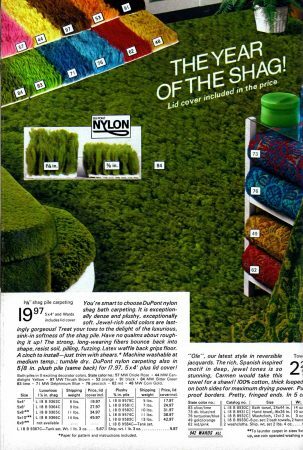 Even the page of solid color bath mats wallows in excess, both in colors (this “Oriole Rose” is “Hot Pink” by any other name) and in carpet pile depth, because as the headline shamelessly proclaims, this is “The Year of the Shag!” Groovy, Baby, Groovy! Just how influenced by the '60s WAS the writer, anyway?